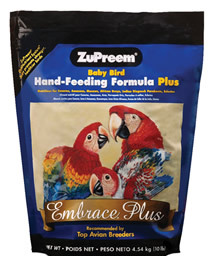 Hand-Feeding Formula delivers maximum nutrition for stronger, healthier baby birds. Please remember that hand feeding baby birds should ONLY be done by experienced handfeeders. Technique, constency and temperature play an integral part of hand feeding. Please do not attempt to feed a baby bird if you are not experienced. Perfect for quick monitoring of baby bird handfeeding formula temperatures. Magnified dial. Shatterproof and easy to read.